If you were to ask one of your employees what your brand’s core values are, would they know the answer? How do you think they would respond? Hopefully, your company already has some firm brand values, covered in your initial business plan or your brand guidelines. If not, now may be a good time to consider the nature of your brand and draft those core values. But assuming those core values are in place, how can you make sure your employees are all working in line with those core values? And why is it so important in the first place? Direction and motivation. Core values bring life to your brand, and define what your organization is all about. For existing employees, this can be a source of inspiration and motivation. For new and prospective employees, it’s an indication of whether they fit with your corporate culture. Consistency. Brand values also help you keep your team members working consistently with one another. Your employees will find it easier to form bonds with one another, and work collaboratively on projects. Belonging and morale. When employees feel like they fit with the values of a brand, they develop a sense of belonging with the company. This leads to higher morale (and therefore, productivity), and could increase employee retention as well. So what can you do to keep your employees aligned? 1. Hire the right candidates. Everything starts with the people you hire. The interview process should help you determine, straight away, whether someone’s individual values fit with, are close to, or deviate strongly from your brand values. Even if someone has the appropriate experience, you should pass on them if they aren’t going to fit the culture you want to create. The right people will require less conditioning, will be more likely to stick around, and will even contribute to a healthier, more value-encouraging environment. 2. Use signage to remind employees of values. Office signage can have a powerful effect on employee values and productivity. For example, you could print a massive sign for each of your brand’s core values, and hang them up throughout the office as a reminder of how those values are supposed to be displayed. You could also display motivational signs, designed to subtly showcase your brand values in action, such as reminders of the value of teamwork. Conceptually, it might seem tacky, but these visual cues can radically change employees’ moods, mind states, and patterns of behavior. 3. Demonstrate values from the top down. Employees look to their leaders as role models for the culture they’re going to embody. If you want your lowest and newest employees to support your brand values, they need to be on display from your highest-ranking leaders. Encourage all your executive officers, leaders, managers, and supervisors to display these brand values in their own positions. From there, it’s only natural that the rest of your team will follow—assuming those leaders are respected. 4. Implement and discuss values in employee reviews. If you conduct annual or semi-annual employee reviews, take that time to discuss each employee’s knowledge and embodiment of your brand values. Gauge how they’ve performed in each dimension (such as embracing change, pursuing growth, or being honest), and ask them how they feel about their performance in each category. It’s a good way to remind employees what your core values are, get their opinions on how those core values relate to their individual work, and give pointers on how to do better in the future. 5. Publicly reward people who follow or exemplify your brand values. Finally, take the time to publicly acknowledge and/or reward employees who do a great job of demonstrating core values. For example, you might call out an employee who demonstrated the nature of team spirit in a collaborative project, and treat them to lunch or give them the rest of the day off. This will make the employee in question continue this pattern of behavior, and encourage your other employees (who witnessed the reward) to strive for similar levels of adoption. 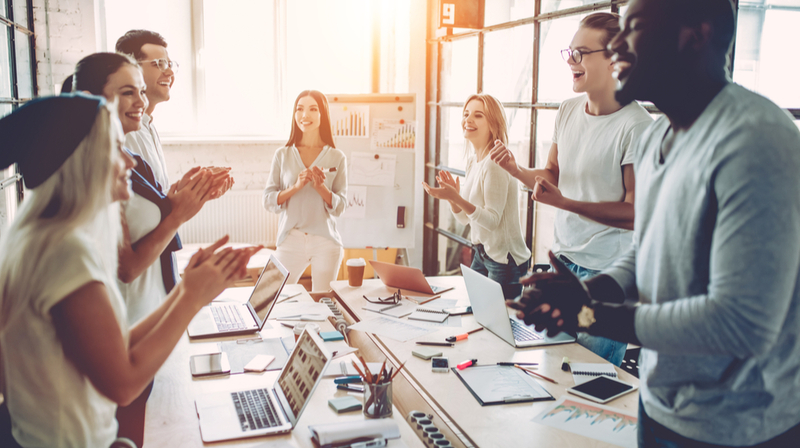 With these tips, you should be able to build and maintain a culture that resonates throughout your office and individual employees. If successful, productivity and morale should both increase, and you’ll have an easier time collaborating and working toward collective goals. This is a long-term, ongoing process, so don’t be discouraged if these core values don’t take right away. Be patient, and eventually, your team will fall in line.